I write because I am a chronic daydreamer. Day in and day out, when I am not obsessing about the atrocities that span our seemingly ever shrinking globe, I envision a world where we are not at war with each other and where we are not causing the destruction of the planet. I am not thinking of some unrealistic unobtainable Utopian future, but a still wondrous and viable future where we are once again in balance with nature and ourselves. Writing is my way of connecting with others who can envision the same – who’s hearts yearn for the people of this world to find some peace. To make peace. I write because I want to share the story of my people. It is my aim to help put a stop to the continued degradation and desecration of my culture and my homelands – because we are survivors. I write as a way to learn, teach, and perpetuate ‘Olelo, the language of my people. We call ourselves by many names, some of which are Kanaka Maoli or ‘Oiwi, but we are known to most people as Native Hawaiians. I write to bring forth concepts and perspectives that are uniquely ours, and some which are undeniably universal. I write to honor my ancestors and to inspire our future generations to move forward with the unfinished vision of our kupuna, our elders. I write to extend an invitation to the present and future generations of the world to create a better life where the balance of nature is honored everywhere. Through my writing I nourish the cord of awakened consciousness. I write because I want to cultivate understanding. We have a saying – ola na iwi. The bones live. The bones refer to my people, but it also refers to our ancestral lands. I write because the bones live. BIO: Meridian Kahili is an ‘Oiwi or Kanaka Maoli woman of mixed ancestry. She is an indigenous rights activist, a post colonial feminist, and an aspiring writer of speculative fiction. Her hope is to engage with and inspire other indigenous Pacific Islanders to write more Science Fiction and Fantasy and other works of speculative fiction. Her writing focuses mainly on debunking stereotypes and misconceptions of Native Hawaiian history, culture and people. Part of the Kanaka Maoli diaspora, she was born in Honolulu, Hawaii and raised in the southeastern United States. 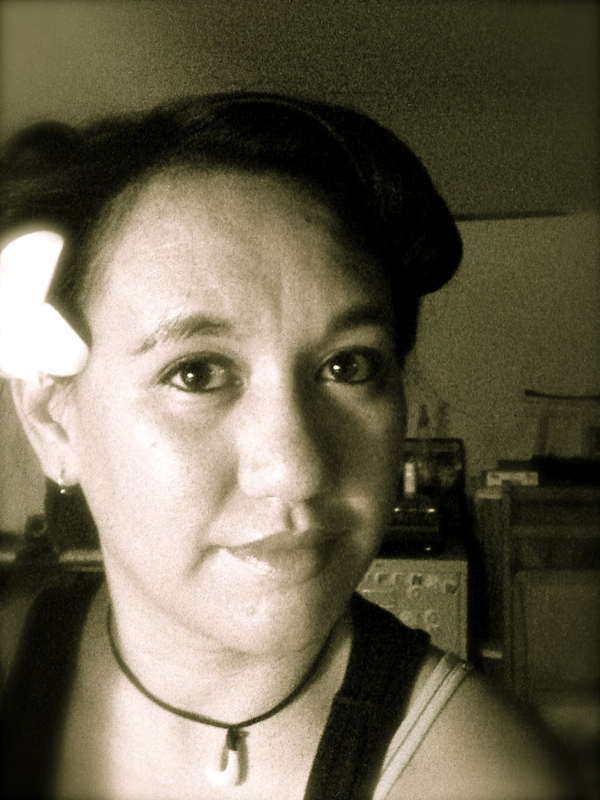 Meridian Kahili loves gardening, natural medicine, wildlife, folklore, mythology, archery, and chocolate. She presently resides in New Smyrna Beach, Florida with her husband and their daughter, along with a handsome black cat, and one really goofy Boston Terrier. Previous Previous post: Michele Arnesen writes because…. Next Next post: Rich Boucher writes because…. I really enjoy reading about what inspires people to become writers. My interest has been piqued after reading about Native Hawaiian history and culture. I want to learn more! Thanks for opening a window and letting a breath of fresh air enter into my life. Please share more about Hawaii. It is one of the destinations on my “bucket list” of places to visit. Not for the tourism, but for the beautiful, natural habitats.